CLEVELAND, Jan. 5, 2017 /PRNewswire/ -- TempTraq's new 48-hour body temperature monitor, doubles the run-time of its existing patch. To help parents care for sick children, especially through the night, the TempTraq® wearable, Bluetooth® temperature monitor continuously senses, records and sends body temperature for up to 48 hours to a mobile device through its free downloadable app. Now, parents can have peace of mind longer, when they need it most. TempTraq alleviates many concerns of those caring for a sick child, including eliminating the need to continually disturb or wake them when rest is critical to a speedy recovery. Plus, no more poking or prodding an already irritable child to get an accurate temperature reading. The wearable patch delivers on-the-spot temperature readings in just seconds and even sends alerts to mobile devices when the child reaches a pre-determined, user-set temperature level. Unlike other devices that provide users with only one point of data and offer no continuous monitoring or alerts, the accompanying free downloadable Apple® or Android compatible TempTraq app allows users of all ages to reach a new level of health care. It displays both real-time and historical temperature data transmitted from the patch in graphical or tabular views, making it possible for caregivers to see fluctuations and quickly adapt treatment, if necessary. Simply press the "start" button to activate the temperature monitor and connect it to the app. Then, apply the thin, flexible patch to the underarm of the patient as directed. As long as the parent is within range of the child (up to 40 feet away), they can easily review data and receive alerts. TempTraq further simplifies the temperature reading process by providing easy-to-follow colors that indicate temperature levels: Green, less than 100.4°F; orange, equal to or greater than 100.4°F; red, equal to or above the user-set temperature alert level. The single-use, hygienic design eliminates the hassles of cleaning the device between uses or among different users. TempTraq's existing 24-hour patch is available now for $19.99 online at Amazon.com, Target.com, and CVS.com and in stores at Walgreens, CVS, Target, Kroger, Fry's, Dillon's, Ralph's and Hy-Vee. The new 48-hour patch will be available for purchase for $24.99 in Q1 2017. Headquartered in Westlake, Ohio, Blue Spark Technologies, Inc. is the leader in developing thin, flexible, printed power solutions for printed electronic systems, including solutions developed utilizing their thin, flexible proprietary battery technology. Blue Spark Technologies' latest innovation, TempTraq®, is the only Bluetooth®, wearable temperature monitor in the form of a soft, comfortable patch that continuously, safely and comfortably, monitors body temperature for up to 24 or 48 hours and sends alerts to Apple® or Android compatible mobile devices. 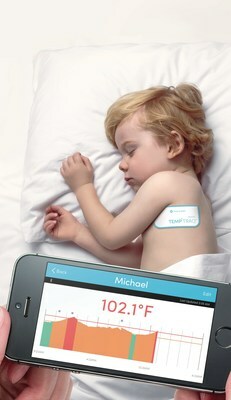 The company's TempTraq Connect HIPAA-compliant service supported by Google Healthcare Cloud Platform allows parents and caregivers to monitor body temperature from anywhere. It also allows direct integration with health care provider electronic health records (EHR) systems and central nurse's stations, providing a secure method of storing patient health care data.